Childbirth consists of a three-stage period beginning with uterine, contractions, and ending in the expulsion of the placenta. 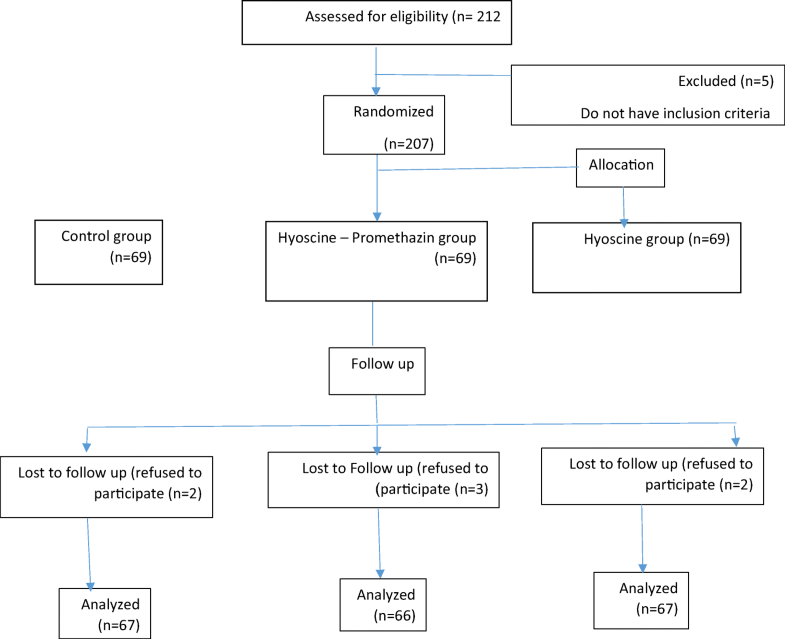 The aim of this study was the effect of intramuscular hyoscine and hyoscine-promethazine on the duration of labor in nulliparous pregnant women. This study was a triple-blind clinical trial on 213 nulliparous pregnant women who had referred to Amiralmomenin hospital in Zanjan, Iran. Selection of samples was random and done with using 3, 6(1:1:1) of blocking ratio. This study had three groups. The first group received 20 mg hyoscine (group A), the second group 3 cc sterile water (group B), and the third group 20 mg hyoscine and 25 mg promethazine (group C). Data collection tools included a demographic questionnaire, checklist of data, and partograph chart. The mean of the first stage of labor in hyoscine group was 88.95 ± 51.07 min, hyoscine-promethazine 100.05 ± 65.88 min, and control group 170.37 ± 106.87 min. There was significant correlation between A and C and B and C groups (P < 0.001). The mean of the second stage in group A was 46.37 ± 44.60, group B 32.25 ± 17.74, and control group 55.05 ± 44.44 min and a significant relationship was between B and C groups (P = 0.03). The results showed that hyoscine and hyoscine-promethazine can be used to reduce the duration of labor. Pregnancy and giving birth to a healthy infant are very important issues in a maternal life. Improving maternal health and decreasing mortality and morbidity are among the utmost concerns all around the world. In nulliparous women, average duration of the first stage of labor is 4.9 h and the second stage lasts approximately 50 min . Second stage of labor is defined as duration from fully dilated cervix until delivery of the infant. It includes the passive phase, with passive descent of the fetal head, and the active phase, also known as expulsive phase, bearing down or pushing. The active phase starts when contractions become expulsive or when the woman actively starts pushing . Previously, the definition of prolonged second stage of labor in nulliparous women was > 2 h without and 3 h with epidural analgesia . However, recent recommendations often include longer durations in some cases, that is, that management is individualized depending on progress of labor, epidural analgesia, fetal position, and interventions . Prolonged labor may cause adverse reactions such as fatigue, postpartum hemorrhage, sepsis, asphyxia, fetal distress, and increase mortality and morbidity of both mother and infant . Prolonged second stage of labor is associated with an increase in cesarean rate , operative vaginal delivery [4, 5, 6, 7, 8, 9]6-, chorioamnionitis , grades 3 and 4 tear [4, 10], trauma [4, 5, 6, 7, 8, 9],6-4, atonic uterus , low Apgar score in the first minute, postpartum infection, infant hospitalization [11, 12], and meconium-stained amniotic fluid . Use of oxytocin to reduce the length of labor can also be a factor in increasing cesarean rate [10, 13]. Studies indicate that atropine, which is a broad-spectrum anticholinergic drug, is associated with reducing active phase of labor, total length of labor, and an increase in cesarean sections, and side effects like dry mouth, tachycardia, and urinary retention might appear . In multiple studies of antispasmodic drugs used in labor [15, 16, 17, 18, 19, 20, 21, 22, 23, 24, 25], hyoscine is an antimuscarinic medication (anticholinergic and antispasmodic) and competes with the action of acetylcholine on muscarinic receptors. It is helpful in reducing the types of spasms and is known under other commercial brands as scopolamine, HBB, and Buscopan, and its pregnancy category is C .
In a Cochrane review known as “antispasmodic for labor” (2013), it was stated that there was no statistical significant relationship between musculotropic drugs with tachycardia, fetal distress, fetal tachycardia and bradycardia, admission to NICU, mouth dryness, headache, nausea, vomiting, dizziness, giddiness, and meconium-stained liquor, but flushing of face and postpartum hemorrhage were significant . Promethazine is an antihistamine and is derived from phenothiazine (H1 receptor inhibitor) and can have a similar effect as anticholinergic and antimuscarinic drugs on inhibiting acetylcholine receptor. One of its brands is Phenergan and its pregnancy group is C. The drug can be used as a sedative, anti-nausea, and antimuscarinic activity . In the delivery room (especially in Zanjan-Iran hospitals), promethazine is used to reduce nausea , to sedate , and to relieve pain [29, 30]. In a Cochrane systematic review titled as “antispasmodic for labor,” 21 articles were analyzed (with 3286 participants) and no side effects and neonatal risks of this drug were mentioned . Hyoscine butylbromide was one of the several drugs studied. 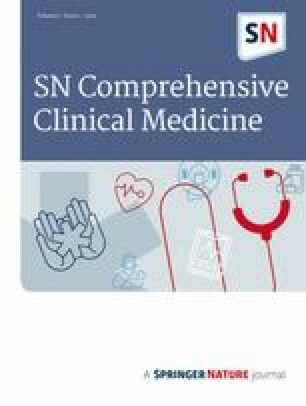 In this study, antispasmodic is reported to be used around the world and, however, the quality and number of articles for policy and decision making by clinicians is very low. Still, some other studies have contradictory results and more and high-quality studies have been recommended. In this article, it is stated that most of the studies are biased ones and only four of them are said to be less biased about antispasmodics. In other studies, no blinding was observed and how to hide the allocation was not also described in the literature . On the other hand, work experience in the delivery room proves the use of these drugs to increase the speed of delivery, but despite the widespread use of these medications, there are few studies on the effects and side effects of these drugs. On the other hand, hyoscine and promethazine are cheap and available medications and this can economically be an important issue. Considering a few researches in this area and using different antispasmodics administered IV, IM, and rectal without no scientific reliable basis for the development of delivery, we decided to study on hyoscine and promethazine on reducing the duration of labor. This study is a triple-blinded randomized controlled clinical trial (blinded participant, data analyzer, and investigator) that was done in 2015and early 2016 on 213 nulliparous mothers who referred to Amiralmomenin hospital (Zanjan, Iran). After Ethical approval by the ethic committee of research deputy of Tabriz University of Medical Sciences (09/24/2015, 5/4/10385) and registration in IRCT with number of IRCT201512163027N29, informed consent was obtained from all participants. Samples were classified into three groups: using Rand List software and blocks A (hyoscine), B (distilled water as a control group), and C (hyoscine-promethazine). For investigator blinding, participant received 20 mg (1 cc) hyoscine with 2 cc of distilled water in group A (a total of 3 cc), 3 cc distilled water in group B and 20 mg hyoscine (1 cc) plus 25 mg (1 cc) promethazine, and 1 cc distilled water in group C (a total 3 cc). So, the contents of each syringe in all three groups had the same appearance and volume (3 cc) and were injected to the participants at the beginning of the intervention. Generation of random sequences, allocation of concealment, and administration of intervention were done by another person except research team. Inclusion criteria included term for gestational age (37–41 full week), spontaneous onset of labor, dilatation 4–5 cm, effacement 50–60%, more than 6 h has not passed of rupture of amniotic membrane, single baby, nulliparous (with or without abortion), the absence of obstetric complications in pregnancy and mother’s certain diseases, the absence of indications for a vaginal birth control, the absence of problems related to the fetus, lack of fetal abnormalities, normal maternal BMI (18.5–24.9), fetal weight in the normal range, the absence of major pelvic tightness, cephalic presentation, mother’s height at least 150 cm, age range between 18 and 35, and the absence of glaucoma in mother (based on a mother’s statement). Exclusion criteria were sensitivity to hyoscine and promethazine, not wanting to continue to participate in the study, defective fetus view, epidural analgesia, and medical intervention leading to elimination of blinding or using other medications. A collaborator placed all samples using the abovementioned method in three groups A, B, and C.
With regard to the allocation sequence and parcel numbers, letters A, B, and C were jotted down in the opaque envelopes. If the mother had the inclusion criteria and also the inclination to the inclusion, she filled the consent form, and a base CTG (cardiotocography) was taken before the intervention to assess the fetal heart rate (in case of having problem in basic CTG, mother was removed from the study). In the intervention time, i.e., dilatation 4–5 cm and 50–60% effacement, vital signs were measured and recorded before injection. About 30 min after the intervention, the participants were asked about the feeling of dizziness, tachycardia, dry lips, facial flushing, headache, nausea, confusion, and drowsiness, and their cases were recorded and vital signs were monitored as well. Vaginal examinations conducted by the researcher were recorded each hour. If a participant had early signs of first stage completion (for example, feeling of defecation or sudden bloody show), she would be reexamined and the situation was recorded in partograph. Following the maternity block routine, CTG was taken every 2 h (except for mother’s condition or FHR problems) and the results were recorded. After completion of the first stage of labor, vaginal examination was done in case of an increase in the second stage. Duration of the second stage (full dilatation and effacement for cervix to complete withdrawal of the baby’s body) and duration of the third stage (complete withdrawal of the infant’s body to complete withdrawal of placenta (in minutes)) were recorded in the checklist. All these steps were taken by the investigator in the delivery room; also, she was responsible for outcome measure assessment. During the study, four participants of hyoscine groups, three participants of control group, and five participants of hyoscine-promethazine group were excluded from the study, and eventually, 201 participants remained. Data collection tools included a demographic questionnaire, a standard partograph form, and a checklist. Demographic questionnaire included name, date of birth, job and education of mother and her husband and place of residence, abortion in her previous pregnancies, BMI, and their telephone number. To register cervical dilatation and effacement, station, amniotic fluid situation, FHR, and the number of contractions in 10 min and induction, partograph standard forms were used. Information checklist includes vital sign before and after injection, fetal bradycardia and tachycardia, the loss of beat to beat variability, long-term deceleration of fetal heart rate, duration of the active phase, duration of the second stage, duration of the active phase plus the second stage, duration of the third stage, birth weight (of gram), 1 and 5 min Apgar, kind of delivery (vaginal delivery without episiotomy or rapture of birth canal, operative delivery, episiotomy, episiotomy with rapture of birth canal), rapture of delivery canal (1–4 degree), uterus atony, cervical laceration, need for infant recovery (in case of resuscitation recovery: skin irritation, oxygen plus irritation, using PPV, heart massage, and pharmacotherapy), hospitalization of the neonate in NICU, drug side effect (mouth dryness, headache, nausea, vomiting, dizziness, giddiness, flushing of face, feeling drowsy, and reduced visibility) before and after injection, and accelerated delivery. The findings suggest that participants’ average age in group A was 21.25 ± 2.5, in group B 21.32 ± 2.98, and in group C 22.58 ± 3.94. Their husbands’ average age was 26.13 ± 2.32 in group A, 25.97 ± 3/0 in group B, and 27/0 ± 2.83 in group C. Ninety-seven percent of the participants in group A and 100% of the participants in groups B and C were housewives. In more than 90%, husbands were self-employed. With respect to education, in groups A and C, about half of the participants have held high school or diploma degree, while in group B, about half of them had some elementary education. Regarding husbands’ education, in the majority of cases, they held elementary and secondary education degree. With respect to the residence, two-thirds of the participants were living in the village. The average BMI of participants was 21.80 ± 1.86 in group A, 22.05 ± 1.74 in group B, and 21.13 ± 1.41 in group C. In more than three-quarters of the cases, there was no history of abortion. The average birth weight was 3187 ± 256 in group A, 3127 ± 283 in group B, and 3090 ± 312 g in group C (Table 1). For normalizing uterine contractions, 47.8% of group A, 66.7% of group B, and 58.5% of group C were stimulated by oxytocin. There was no statistically significant difference among groups (P = 0/8). The results in Table 2 indicate that the average duration of active phase in group A was 88.95 ± 51.07 (95% CI 37.88–140.02), in group B was 170.37 ± 106.87 (95% CI 63.5–277.24), and in group C was 100.05 ± 65.88 min (95% CI 34.17–165.93). This difference among groups was statistically significant. Applying the Tukey’s test, the difference between groups A and B was P < 0.001 and between B and C was P < 0.001. In other words, based on these observations, hyoscine and hyoscine-promethazine can reduce average duration of the active phase of labor. By adjusting confounding factors (neonatal weight, mother’s age, and BMI), the average length of the first active phase (Mean ± SE) in group A was (83.99 ± 9.046), in group B was (162.485 ± 9.069), and in group C was (111.955 ± 9.501). These differences among groups were statistically significant (Table 3). Applying Tukey’s test, the same results were achieved: i.e., the difference between groups A and B was P < 0.001 and between groups B and C was P < 0.001. The average length of the second stage of labor in group A was 46.37 ± 46.60 (95% CI 1.77–90.97), in group B was 55.05 ± 44.44 (95% CI 10.61–99.49), and in group C was 32.25 ± 17.74 min (95% CI 14.51–49.99). These differences among groups were statistically significant (Table 2). Applying Tukey test, there were significant differences between groups B and C (P = 0.02). By adjusting confounding factors (neonatal weight, mother’s age. and BMI), the average length of the second stage (Mean ± SE) in group A was (47.020 ± 4.587), in group B was (55.841 ± 4.632), and in group C was (30.795 ± 4.816). These differences among groups were statistically significant (Table 3). Applying Tukey’s test, there was significant difference between groups B and C (P < 0.001). The total length of active phase and the second stage in group A was 135.33 ± 63.98 (95% CI 71.35–199.31), in group B was 225.43 ± 114.71 (95% CI 110.72–340.14), and in group C was 132.33 ± 73.14 min (95% CI 59.19–205.47). These differences among groups were statistically significant (Table 2). Applying Tukey’s test, there was significant difference between groups A and B (P < 0.001) and groups B and C (P < 0.001). By adjusting confounding factors (neonatal weight, mother’s age, and BMI), the total average length of active phase and second stage all together in minutes (Mean ± SE) in group A was (131.149 ± 9.899), in group B was (220.998 ± 9.998), and in group C was (142.067 ± 10.393). These differences among groups were statistically significant (Table 3). Applying Tukey’s test, the difference between groups A and B was P < 0.001 and between groups B and C was P < 0.001. The length of the third stage does not have a statistically significant difference among these three groups (P = 0.105) (Table 2). The present study is aimed to evaluate the effects of intramuscular hyoscine and hyoscine-promethazine on the duration of labor in the nulliparous women. In this study, 201 nulliparous women were compared during their first stage (active phase), second stage, third stage, and their active phase plus second stage together. The first finding from this study showed that hyoscine and hyoscine-promethazine can reduce length of the first stage (active phase) of the labor. This study showed that the length of the active phase (in minutes) in groups A and C was significantly less than group B.
Makundi et al. (2011) examined the impact of hyoscine-N-butylbromide suppository on pain and delivery process and concluded that hyoscine-N-butylbromide suppository can accelerate the delivery time but does not have statistically significant effect on the labor pain . In a study done by Fardiazar et al. (2013), 40 mg hyoscine IV were compared with 0.5 mg atropine, and they observed that duration of the first stage of labor in group receiving hyoscine was 218.5 min versus 339 min in atropine group . In a study done by Sukey et al. (1999), they observed that atropine and promethazine together reduce the duration of active phase of labor in multiparous women . In a study done by Mortazavi et al. (2006), they used hyoscine, atropine, and promethazine, and observed significant deceleration for cervical dilatation while did not find any effect on the effacement rate . In Saatsaz et al. (2008), they studied two groups: one has received pethidine and the other atropine-promethazine. In the group receiving atropine-promethazine, they observed statistically significant reduction in the active phase compared to the control group and the group receiving pethidine . All of these studies show the effects of using sedative, anticholinergic, and muscarinic drugs on reducing the duration of the active phase of the labor, which are similar to our findings. The second finding of this study showed that the use of the hyoscine-promethazine can decrease the duration of the second stage of the labor. There was a decrease in duration of labor in group C comparing to the control group. However, comparing group A to control group, there was no statistically significant decrease. Irvani et al. (2006) examined the effect of IV hyoscine on 100 nulliparous women and observed the reduction of the length of and second stage on them . In our study, the duration of the second stage has been reduced in group A but it was not significant comparing to the control group. This discrepancy between our study and Irvani et al.’s study can be due to injection method (IM in our study versus IV in Irvani et al.’s study). But in the injection of hyoscine-promethazine, there were reductions of the duration of the second stage of the labor, which can be caused because of the synergism effect of promethazine on the hyoscine. In a study done by Mardi et al. (2009), they examined the effects of the injection of the hyoscine and atropine on the progress of the stages of delivery in nulliparous women. In this study, 200 nulliparous women with term fetuses were randomly divided into two groups. The trial group at the beginning of the active phase received hyoscine 20 mg and atropine 0.5 IV (dilatation 4 cm or more), and the control group received 20 cc dextrose 5% and outcomes were measured. The length of the active phase and the second stage was reduced in the trial group  and all of these results are consistent with ours. Also, in this study, we did not find any statistically significant differences regarding the length of the third stage among the three groups. In conclusion, the findings of this study showed that hyoscine and hyoscine-promethazine can affect and reduce the total length of the labor (active phase and second stage). In a Cochrane systematic review article titled “Antispasmodics in labor” (2013), it included 21 articles (with 3286 participants). In this paper, HBB (hyoscine-N-butylbromide) was examined and they reported that the use of antispasmodic drugs to reduce the duration of the labor is common in all over the world. But the issue is that the quality and the number of existing articles for clinical decision making is low and recommended to do more research, with a higher quality, particularly on the length of delivery . This study refers to the benefits of injecting a dose of hyoscine and hyoscine-promethazine for the process of childbirth. Larger randomized studies are needed to evaluate the efficacy, safety, and optimal dose of the drug. This article is an approved project of the Tabriz University of Medical Sciences (11/03/2015). Finally, we would like to thank the president, personnel, and the staff of the Amiralmomenin Hospital of Khodabandeh. This project was funded by the Tabriz University of Medical Sciences Deputy. Rohwer Anke C, Khondowe O, Young T. Antispasmodics for labour. Cochrane Database of Systematic Reviews. 2013. https://doi.org/10.1002/14651858.CD009243.pub3. Kausar U, Siddiqui N. To compare the efficacy of drotaverine hydrochloride with hyoscine butylbroumide for increasing the rate of cervical dilatation. IJRCOG. 2017;6(4). https://doi.org/10.18203/2320-1770.ijrcog20171438.